(April 2, 2013) This past weekend, leadership from the Islamic Society of North America (ISNA) participated in a Colloquium of Muslim Minority Leaders to reflect on the state of the Muslim World, especially the situation of Muslims who live in societies where they constitute a numerical minority. The meeting was hosted in Paris, France by the World for All Foundation, based in South Africa. Dr. Ingrid Mattson, ISNA Past President, Dr. Sayyid M. Syeed, ISNA National Director for Interfaith & Community Alliances, and Dr. Mohamed Elsanousi, Director of Community Outreach, participated in the program. Dr. Ingrid Mattson spoke about living in a post-9/11 world, in response to a keynote address by Dr. Tariq Ramadan on extremism and anti-Muslim sentiment. 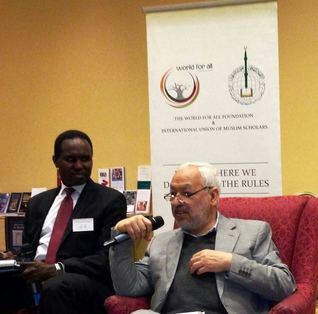 Dr. Syeed spoke about interfaith outreach in North America during a session on “Sharing Best Practices” and Dr. Elsanousi moderated a session on theological and conceptual tools, featuring Shaykh Rached Ghannouchi of Tunisia and others. Contextual Realities: Islamophobia and Extremism – Two Sides of the Same Coin? The Colloquium concluded by appointing a committee to work on drafting a declaration which all participants can review and sign. The hope is that this declaration will serve as a working document to invite discussion and debate on content areas from the global Muslim community.